Familiar story of the hijacked 9/11 plane that crashed into an open field near Shanksville, Pennsylvania. The so-called “fourth plane” involved in the 9/11 terrorist attacks, United Airlines Flight 93 took off from Newark bound for San Francisco. When four young Middle Eastern men seized control of the cockpit, passengers fought back and prevented the terrorists from reaching their intended target: the Capitol in Washington, D.C. In this debut, McMillan, vice president of communications for the Pittsburgh Penguins and volunteer at the Flight 93 National Memorial, re-creates the event—based on passenger phone calls, the cockpit voice recorder, interviews and the official record of the past 13 years—as well as the aftermath, including the dedication of the memorial in 2011. 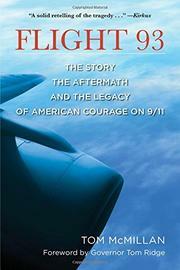 Noting that “we will never know everything…many of the facts are buried with the heroes,” the author pieces together a vivid picture of the scene within the plane: the hijackers instilling fear in everyone (stabbing passengers, threatening to explode a nonexistent bomb) before killing the cockpit crew; the 40 varied passengers (from lawyers and businessmen to students and retirees), 12 of whom made 35 wrenching phone calls, learning that other planes had just slammed into the World Trade Center and the Pentagon; and the brave decision to take back the plane before it destroyed yet another iconic American place. Athletic passengers (a judo champ, a weight lifter, etc.) apparently joined businessman Todd Beamer (“Let’s roll!") and others in storming the cockpit, while the hijacker pilot tried to thwart the sustained assault by rocking the plane. Flight 93 crashed at 563 mph, killing everyone and creating a crater 30 feet across and 15 feet deep. The author recounts the post-crash heroics of coroner Wally Miller and many others in the rural farming and coal-mining community. A solid retelling of the tragedy with no new disclosures.